Nikkei: Sony will subcontract the manufacture of CMOS image sensors to Fujitsu in an arrangement aimed at lowering production costs without revealing proprietary technologies to overseas foundries. Update: Reuters quotes Nikkei that Sony will begin subcontracting output to Fujitsu as early as the current business year to next March at a pace of several thousand silicon wafers a month and may expand more depending on the impact on its cost base. Sony is the world's No.6 maker of CMOS sensors with an output capacity equivalent to 16,000 silicon wafers a month, according to the Nikkei. The deal with Fujitsu should allow Sony to meet growing demand for image sensors while keeping production costs in check and safeguarding its proprietary technologies in Japan, the Nikkei business daily reported. A spokesman for Sony said the electronics giant has been considering outsourcing some image sensor production to meet strong demand driven by growing sales of advanced digital cameras and smartphones, but declined to comment further. A Fujitsu spokesman declined to comment. Update #2: Jiji Press says that Fujitsu, will undertake 80-90% of the manufacturing process, while Sony will handle the remaining part of the process. Fujitsu willuse its plant in Kuwana, Mie Prefecture, central Japan, for the sensors production, according to Jiji sources. Engaged, CNET-Asia: Most DSLRs can can record video between 5 and 12 minutes, although the reason for this limitation was not officially stated. Now, Sony has confirmed (in Japanese) that the recording time limit on its latest Alpha SLT-A55 and A33 cameras are due to overheating image sensors. When the sensor-shift image stabilizer is turned on, the A55 can record for a maximum of 9 minutes at 20C, and the time is reduced to 6 minutes if the temperature rises to 30C. However, if you turn off the sensor-shift IS, you can film up to 22-29 minutes at 20-30C temperature, respectively. EETimes, Electronics Weekly: Irish start-up Movidius announced Myriad 3D, its mobile 3D imaging and video platform. While many others work on it, Myriad 3D is claimed to be the first 3D platform allowing handset designers to easily produce a new generation of 3D-enabled smartphones. 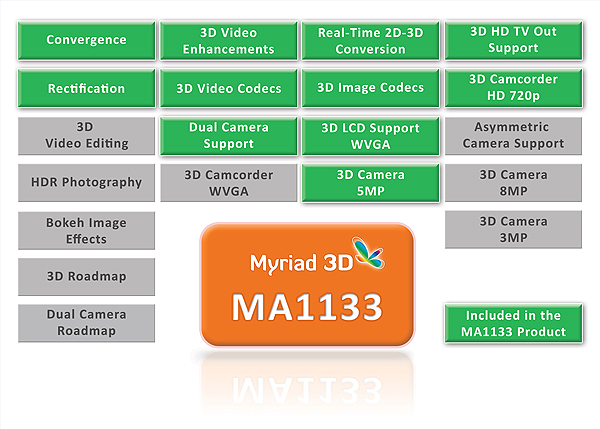 The first product in the Myriad 3D platform range is the MA1133 co-processor, capable of a range of 3D functions: preview, capturing and processing user generated 3D video and images on a mobile phone; converting any 2D video to 3D in real time, and upscaling and playback of content in HD. It employs an eight core 32-bit floating point processor with the equivalent of 20GFLOPS performance. Movidius will demonstrate the technology at CES in January. In May Movidius rased $7.5M in series B round, bringing the total investment to $20.5M (EETimes). Digitimes: Etron's eSP258 and eSP268 low-cost webcam controllers allowed the company to take a more than 50% share of the PC camera market in China, Taiwan and Asia. The eSP258 features a small die area, while the eSP268 has a built-in OTP. Etron has developed a firmware architecture for its webcam controllers, which allows customers to re-program their settings onto a built-in OTP memory without external EEPROM or SPI flash. Etron has expanded its portfolio with the eSP568, a new webcam controller series that inherits all features of its previous generations, such as built-in OTP, LDO, etc., and also incorporates a built-in audio ADC/AGC to enable audio and video operation on one chip. MANO 9600 is 2/3-inch 9.6MP/20fps sensor based on 2.4um pixels. The sensor targets the biometrics optical fingerprint market. Its full well is 12Ke, PRNU is 2%, fill factor is 70% and QE is "40 to 50% at average visible band". The engineering samples are available in Q2 2011 in color and monochrome versions with microlens. Link 2K, 6K and 8K are fast linear sensors based on 14um and 7um pixels. In this paper, a leading edge N65 0.9um pixel BSI technology using 300mm bulk silicon wafer is reported with process breakthroughs. Challenges to go beyond <0.9um pixel size are discussed. A 3x3 prototype image sensor array of CMOS avalanche photodiodes with 3-transistor NMOS pixel circuitry is integrated in a 90nm CMOS image sensor technology. A 5um pixel pitch is obtained with <1% crosstalk, 170Hz mean dark count rate at 20C, 36% photon detection efficiency at 410nm and 107ps FWHM jitter. C. Niclass, M. Soga, Toyota Central Research and Development Labs, Inc.
A CMOS single-photon detector, including a highly miniaturized active recharge circuit, achieving the highest counting rate yet reported for an afterpulsing-free Geiger-mode photodiode is introduced. Thanks to its low-noise and 6-ns dead time figure, a dynamic-range of 116dB for steady-state photon counting in a single acquisition time of 20ms was achieved. A low noise, high quantum efficiency Ge photo-diode was integrated in a 10 µm pitch video graphics array CMOS image sensor, the first large-scale integration of single crystal Ge into a silicon product. Night imaging in moonless conditions was demonstrated in this technology for the first time. We present state-of-the-art 10 µm pixel pitch hybrid AlGaN-on-Si EUV imagers. 256x256 backside illuminated Focal Plane Arrays were integrated with dedicated CMOS readouts. The AlGaN active layer provides intrinsic solar blindness with 280 nm cut-off wavelength. Sensitivity was verified using synchrotron radiation down to 1 nm wavelength. By chiral-shape patterns over finger-type electrodes of conventional photodiode, for the first time, record high >80% external quantum efficiency (EQE) and polarization detection capability are successfully achieved simultaneously through the self-accumulated local electric field due to strong local surface plasmon resonance (LSPR). Device has expected high efficiency to absorb the incident visible energy profiting the visible applications potentially. Market Wire: Invisage won The Wall Street Journal 2010 Technology Innovation Award in the semiconductors category. John M. Leger, a Journal news editor who oversees the Innovation Awards, said: "Judges were very impressed with InVisage's QuantumFilm technology. It should open up a lot of new applications in a variety of consumer products." "Our drive to innovate, to find solutions outside the existing image-sensor model is what led us to look beyond traditional silicon," said Jess Lee, CEO, InVisage Technologies. "QuantumFilm is poised to become the de-facto next generation camera platform. We are honored to be so prestigiously recognized for our efforts by The Wall Street Journal." The Wall Street Journal received nearly 600 entries, with only 8% receiving this award. PR-Newswire: Joseph F. Finn, Jr., C.P.A., announced that assets of NoblePeak Vision Corp. of Wakefield, Massachusetts have been assigned to him for the benefit of NoblePeak's creditors. NoblePeak holds numerous patents in germanium (Ge) on silicon processing. Its TriWave technology is the world's first Germanium-enhanced, CMOS image sensor technology, which delivers sensitivity and resolution across the visible, near infrared (NIR) and short wave infrared (SWIR) spectrum. The intellectual property, fixed assets and inventory will be sold by a sealed bid sale at 12:00 noon on November 5, 2010.
Business Wire: Ambarella announced A7 SoC for advanced hybrid still and video cameras. The new A7 delivers full HD 1080p60 or 4Mp30 H.264 video recording. Its high-speed 500Mpixels/second capture capability enables numerous new features including smooth slow-motion replay for sports action, HDR, best-picture selection from a series of shots, 3D motion-compensated noise reduction (MCTF), multiple exposures, and rolling shutter correction for CMOS sensors. Hardware support is provided for real-time face tracking at full 1080p60 video resolution. The A7 SoC and hybrid camera reference design kit and SDK are available immediately. Update: Business Wire: Ambarella’s A7 hybrid SoC is utilizing Samsung's 45nm low power (LP) process technology. Market Wire: InVisage's QuantumShutter solves the rolling shutter problem by using a portion of the silicon to store the image "charge" so the entire image is captured at the exact same moment. Because of its QuantumFilm sitting on top of the pixel, InVisage can use the silicon space underneath for a storage node. InVisage spent three years engineering the quantum dot material to produce highly-sensitive image sensors that integrate with standard CMOS manufacturing processes. "While other image sensor companies have been focused on increasing the number of pixels, InVisage is focused on bringing completely new thinking and technologies to CMOS image sensors -- like tackling rolling shutter," says Jess Lee, CEO, InVisage Technologies. "InVisage's QuantumShutter will bring better and more reliable picture quality to an industry that is desperate for innovation." Update: Invisage web site states that the image above came from 1.4um pixel test chip. "This image is the first and only 1.4um pixel in world which can implement this [QuantumShutter] feature." QuantumShutter will be available as an option on InVisage's first product due to be sampling later this year. Albert Theuwissen continues his famous series of PTC articles, now talking about pixel defects and how they distort the sensor parameters extracted from PTC. Photonics.com: EC started funding of SPADNet project aiming to develop the CMOS-based large area networked image sensors for photon-starved biomedical applications. SPADnet's prime objective is to develop a scalable photonic component for large format, rare-event imaging. The core of the component will be a SPAD array implemented in CMOS. Large formats will be achieved by tessellating several tens of dies in abutment style using innovative packaging techniques based on TSVs. The ability to stamp the time and position of each photon impingement in a burst event offers a second key advance. The concept of spatial oversampling is introduced, where a single measurement is partitioned into a myriad of sub-measurements, occurring simultaneously. The difference is that in space oversampling many SPADs will detect the same event independently, thus reducing the dead time on average by the number of detectors involved. SPADNet project members are: EPFL (Switzerland, coordinator), Fondazione Bruno Kessler, Trento (Italy), LETI (France), Mediso (Hungary), STMicro (Scotland & France), TU Delft (Netherlands), University of Edinburgh (Scotland), University of Budapest (Hungary). SPADnet was granted €3.7 million of funding over a 42 month period. in3Depth Systems SA/NV, the financial holding controlling Softkinetic, Optrima and Softkinetic Studios has announced the closing of the first part of its Series B financing round, with an €8 million strategic investment by European telecom operator Belgacom and SRIW Techno, the technology venture capital fund of SRIW. The Series B financing will be used to continue technology developments, accelerate commercialization efforts and finance working capital. Fraunhofer Press, Photonics.com: The Fraunhofer Institute for Microelectronic Circuits and Systems IMS in Duisburg has developed a CMOS image sensor for an industrial customer which can operate at temperatures ranging from -40 to +115 degrees Celsius. The research scientists have succeeded in developing pixels which exhibit an extremely low dark current. This reduction makes it possible to capture high-quality images even in extreme heat. The sensor has a resolution of 256 x 256 pixels and an image size of 2.5 x 2.5 centimeters, translating into 100um pixels. The reported DR is 90dB. The sensor supports both global and rolling shutter. The chip is produced in 0.5um CMOS process. Business Wire: Aptina announced 14MP MT9F002 sensor integrates the company’s latest A-Pix pixel technology, resulting in an increase of nearly 25% in low-light sensitivity, and providing greatly enhanced, high-quality still image capture over the company’s previous MT9F001 14MP image sensor. The high-speed MT9F002 sensor combines an enhanced 1.4um pixel with advanced features, such as electronic image stabilization (EIS), and digital re-sampling. The new sensor also has 1080p/60fps HD video capability, and flexible, high-speed interface options, including four-lane HiSPi (high-speed serial pixel interface) and parallel or four-lane MIPI. Aptina’s MT9F002 begins sampling in October in limited quantities. 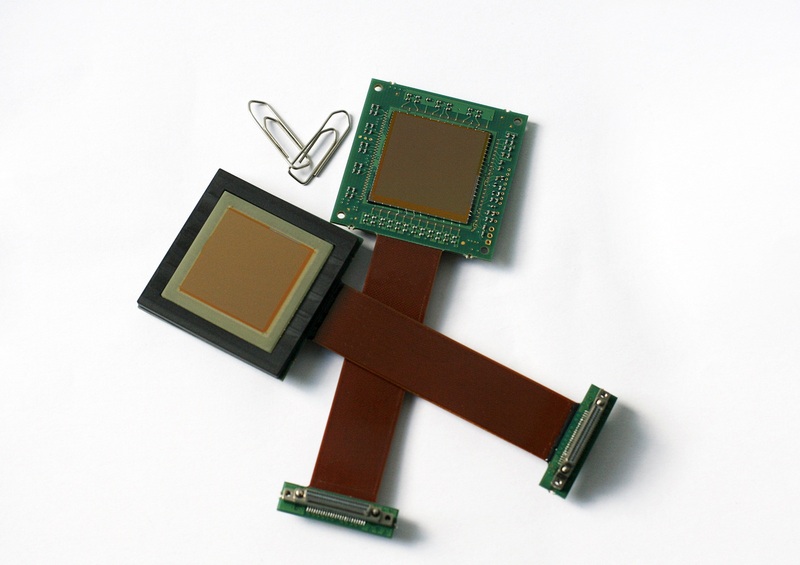 Mass production is scheduled for Q1 2011.
Business Wire: Aptina introduced an APS-C format 16MP MT9H004 image sensor. The new MT9H004 sensor offers high sensitivity, low dark current, and low readout noise in addition to 16MP still image capture at 10fps. Leveraging the company’s latest dynamic response (DR) pixel technology innovation, called DR-Pix technology, the new APS-C format imaging solution delivers a 5dB increase in SNR under low-light conditions without sacrificing the performance in high-light environments, where it can achieve a max SNR of 47dB. Aptina’s new solution also offers advanced features, such as live view video support, and 1080p/30fps HD video recording. TSR estimates CMOS image sensor shipments for the DSLR market to be 12.5 million in 2013, up from 4 million in 2007, with much of this growth coming from the emerging compact mirrorless segment of the market. “Our new sensor is only the first step in our effort to secure a prominent position in this exciting market,” said Sandor Barna, GM of Aptina’s Camera Business Unit. Aptina’s innovative approach to improving low light performance without compromising image quality utilizes a dynamic response pixel, called Aptina DR-Pix technology. Aptina DR-Pix technology combines two modes of operation in one pixel design – low conversion gain (LCG) mode for large charge handling capacity in bright scenes and a high conversion gain (HCG) mode with increased sensitivity and low read noise for low-light scenes. The inter-scene DR equal to 82.9 dB due to the low read noise of the HCG mode. In comparison, without the HCG mode of operation, the sensor’s DR would be limited to 69 dB of intra-scene DR in the LCG mode. Sampling now, Aptina’s new 16MP MT9H004 image sensor is available in a 116-pin CLCC package. Mass production is scheduled for Q1 2011. DP Review: Marketed as 46MP (4,800×3,200×3 layers) 24×16mm APS-C X3 direct image sensor features in the new Sigma SD1 DSLR camera. It's certainly not easy to fit 3 quite complex pixels into just 5 x 5um area. It's nice to see that Foveon continues to refine its X3 technology. Trading Markets: DxO Labs and Marvell announce a licensing agreement to integrate DxO Labs programmable hardware core and image processing technology into Marvell ARMADA application processors. "The DxO ISP offers our mobile customers stunning image quality for mobile connected consumer devices like cameras using low cost raw sensors or video cameras and image capture oriented devices", said Hongyi Chen, VP of Engineering, Marvell Processor Group and Application Processor R&D. "Marvell customers will benefit from DxO Labs image quality but they can also differentiate their products by using optional software add-ons from DxO Labs such as extended depth of field (DxO DOP) or self learning pixel corrections (DxO DPP)", said Jerome Meniere, Chairman and CEO of DxO Labs. Inquirer reports from the last week's Future World Symposium in London: Bob Gove, president and CTO of Aptina, said pixel sizes on both CCD and CMOS camera sensors are shrinking roughly in line with Moore's Law, pushing up resolutions. Changes in pixel microstructure will make them more efficient, enabling them to capture scenes in low light. And, by processing multiple images captured in rapid succession, cameras can capture details of both shadows and highlights in a scene. Speaking after his address, Gove reckoned that by 2014 cameras will be able to match the human eye in its ability to easily capture a scene in virtually any lighting condition. Korea Times quoted Park Sang-jin, president of Samsung’s digital imaging division, saying "As the issue with 3D televisions is providing a glass-free viewer experience, 3D cameras has a similar challenge for achieving a one-lens, one-imaging sensor approach. The two-lens, two-sensor 3D camera released by Fuji is still too expensive and inconvenient for users." Park also said that the company may produce a camera capable of taking three-dimensional (3D) images sometime next year, but admitted that it will be a digital guinea pig, saying that the "real" 3D cameras that are suited for conventional use won’t probably be available until after 2012. - Rising demand for digital cameras, which are increasingly using image sensors"
"Complementary metal-oxide-semiconductor (CMOS) image sensors have not been able to provide great image quality as compared to others like (Charged-Coupled Device) CCD image sensor. Temporary noise problem, where, CMOS image sensors suffer from higher noise due to the additional pixels, is another important deterrent." "For the purpose of this report, the Global Image Sensors market refers to an integrated chip that contains a processor core, memory, programmable input/output ports and timers." A single-user license costs $1,500 for those willing to pay for it. By the way, Technavio forecasts the image sensors market to grow at a CAGR of 11.8 percent, with APAC region witnessing highest growth rate, according to Business Wire. Thanks to A.T. for this info. Business Wire: Samsung announced two new 1.4um CMOS imagers, the 1/4-inch 5MP S5K4E5 and 1/2.33-inch 14.6MP S5K2N1, adopting BSI pixel technology. S5K4E5 is optimized for smartphone applications, while S5K2N1 is targeted to DSCs and digital video cameras (DVC). The imagers have been demonstrated at the seventh annual Samsung Mobile Solutions Forum held in Taiwan om Sept. 7th. Samsung’s new BSI imagers are said to show 30% enhancement in low light sensitivity over conventional front side illumination imagers of the same pixel size. The imagers are designed to support full resolution 30fps and 1080/60fps video modes. The S5K4E5 has a wider CRA that reduces the height of the imager package making it attractive for slim, small form factor smartphones with demanding z-height requirements. The S5K2N1 is said to leverage Samsung’s low-power 90nm logic process technology. Samsung is able to offer a dedicated thermal enhanced plastic lead ceramic carrier (TePLCC) package to more effectively dissipate the heat generated by the high performance device. Samples of the 5Mp S5K4E5 are available now with mass production starting in the fourth quarter of this year. The 14.6Mp S5K2N1 is expected to start sampling in the Q4 2010 with production scheduled in Q1 2011.
iSuppli: Shipments of BSI sensors for mid- to high-end smart handsets are projected to reach 33.4 million units in 2010, up from virtually nil last year. The market will continue to post sizable increases during the next four years and rise almost tenfold to over 300 million units by 2014, consumer electronics research from iSuppli indicates. By 2014, approximately 75 percent of mid- to higher-end smart phones will include BSI sensors—a huge leap from the 14 percent projected for the end of this year, she noted. The startling growth of BSI sensors is completely in line with the robust, double-digit expansion projected this year for the overall area image sensor market as it recovers from the economic downturn and also penetrate new applications. 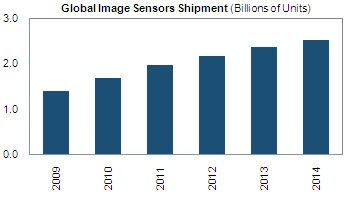 Area image sensor shipments in 2010 will hit 1.7 billion units, up 20 percent from 1.4 billion units in 2009, with revenue during the same period climbing to $6.9 billion, up from $5.9 billion. The fortunes of CCDs continue to decline, iSuppli’s consumer electronics research shows. By 2014, CCD sensor shipments will be off by nearly half of their levels in 2008, with the market inexorably heading in the direction of CMOS image sensors. NIKKEI, Fox Business: Sony said it will spend about Y40 billion to boost its output capacity for image sensors for digital cameras, as it expects the business to grow due to brisk global demand for camera-equipped smartphones and DSLRs. The Japanese electronics giant plans to raise the production capacity of CMOS image sensors at its plant in Kumamoto Prefecture, southern Japan, to 22,500 wafers a month by the next fiscal year through March 2012, from the current monthly output capacity of 16,000 wafers. Update: Business Wire: Now there is an official PR from Sony, saying that the money will be invested over the time from 2H of FY2010 through FY2011. The capacity at Kumamoto Prefecture fab will be increased from 16,000 300mm wafers a month to 22,500 300mm wafers monthly. Sony is going to increase BSI production capability and expand the BSI sensors applications to smartphones as well as a wide range of digital imaging products for consumer and professional use, including DSLRs. Since 2009, Sony has been mass producing BSI sensors for DSCs and camcorders on 200mm wafer lines at Sony Semiconductor Kyushu Corporation’s Nagasaki Technology Center. Furthermore, at the end of this year Sony plans to start the mass production of BSI sensors on 300mm wafer lines at Kumamoto TEC for mobile phone and compact DSC markets. Update #2: The news release at Sony site has some additional information and a picture of Kyushu facility.